When traveling, creature comforts such as warmth and plentiful hot water feel extra-luxurious. But there's usually a price to be paid with a clunky, space-hogging heater. 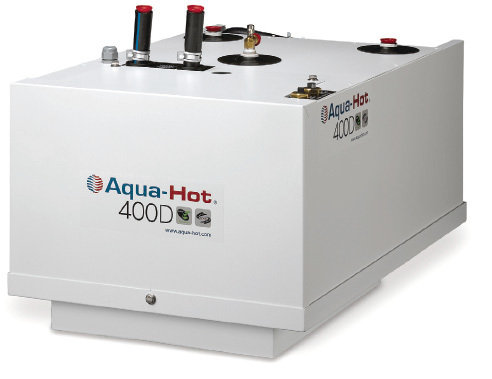 Aqua-Hot's new 400 series Hydronic Heating System gets the job done quietly in a very small footprint. Unlike noisy, cabin-mounted forced-air systems, the 400 is mounted in the bay while producing quiet, even heat by circulating hot water through up to eight Aqua-Hot Cozy Heat Exchangers. Five separate thermostatic heating zones and two circulation loops ensure consistent warmth throughout the living area. Providing on-demand 120° SteadyHot water, the 400 eliminates the need for an external storage tank. With zero recovery time, the dependable unit has a flow rate of 1.25 gallons per minute and can generate a generous 75 gallons of hot water an hour. The self-contained unit reduces potential leak paths and reduces installation time while saving space. At 5.4 gallons, the 400 features a 32% increase of stored heat than previous models in the same footprint. Environmentally friendly, the Aqua-Hot 400 produces 32% lower emissions than competitive models during a 10-minute run-cycle. Energy-efficient, it barely uses 0.1 of a gallon of diesel per hour when driving or parked. With safety a priority, the 400's design features internal steel fuel lines for fire safety. Zero-pressure tanks and an interlock switch prevent the unit from operating when the cover is removed. Measuring just 12" H x 18.5" W x 30" L and weighing only 140 lbs. empty, the compact Aqua-Hot 400 from Aqua-Hot Heating Systems can be easily installed as an RV is being built or retrofitted into an existing coach. According to the 2010 NADA Recreational Vehicle Appraisal Guide, an Aqua-Hot system may add up to $9,400 to the resale value of an RV. Consumers will soon be able to find the Aqua-Hot 400 as standard or optional equipment on new 2012 coach models.